The list of Connecticut statutory forms of deeds (section 47-36c) does not include a form for a grant deed. However, the list of forms provided by statute does not preclude the use of any other type of legal deed. Grant deeds may also be referred to as special or limited warranty deeds in this state. 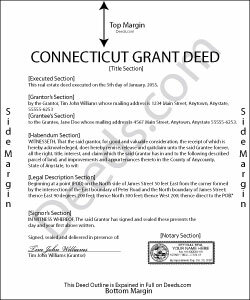 A grant deed transfers real property in Connecticut from one person or entity to another person or entity. Grant deeds warrant that the grantor actually owned the title that he or she is purporting to transfer. It guarantees that the property has not been sold to anyone else, and also that the property is not under any liens or restrictions that have not already been disclosed to the buyer. The grantor to a grant deed in this state must sign the conveyance document and have his or her signature acknowledged. If acknowledged in Connecticut, acknowledgements can be made before a judge of a court of record, a clerk or commissioner of the Superior Court, a justice of the peace, a notary public, or a town clerk (47-5a). If acknowledged in a state other than Connecticut, acknowledgements may be made before any of the officers listed in 47-5a. Grant deeds executed out of state will be valid in Connecticut, so long as they have been executed and acknowledged according to the laws of that state (47-4). Connecticut does not authorize county recording, so all real estate deeds should be recorded in the office of the town or city clerk where the property is located. Unless a grant deed is recorded in the office of the town clerk in the town where the property is located, it will not be effective to hold any land against any person other than the grantor and his heirs. Priority is given to the first recorded deed for the same real estate. Upon delivery to the grantee, a grant deed is effective as against the world, provided that it is recorded within a reasonable period of time following the delivery (47-10).